A little while ago you learned the phrase “a piece of cake“. Remember? If not, come visit our website for review. I’m going to give you another food idiom today. When you have a piece of cake, you may want to have a cup of tea with it. A cup of tea. When you say something is your cup of tea, it’s something you like; something you’re interested in. 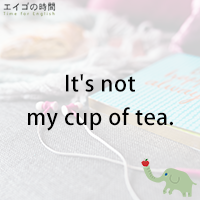 But this idiom is most typically used in the negative form. If something is “not your cup of tea’, it’s NOT what you like or NOT what you’re interested in. For example, I like movies. But horror movies are not my cup of tea. I don’t watch horror movies. Last week I played golf for the first time in my life. To be honest, it was not really my cup of tea. I don’t think I’ll play it again. Now, are you ready to try a quiz? I’ll read a question first; and give you three answer options. Please listen carefully and choose the one that you think is correct. Ready? 1. Mary is really excited about the party. 2. Mary is not all that excited about the party. 3. Mary can’t wait for it. Next Post あんまり好きじゃない – I’m not too crazy about ramen.